6 Months Warranty on Parts and Labor! If your appliance is repaired and the same problem occurs during your warranty period, we will return and determine the cause of the problem. If the problem has anything to do with the original repair, we will repair at no additional fee! If the appliance has another problem, we will treat the repair as if we had diagnosed both problems at the same time and price it accordingly. You pay the same amount, had we made the complete diagnosis on the first trip to your house. If the machine is not worth spending any additional money on, we will give you back the original repair cost, less the Service Call. You can’t lose! We will make you feel like one of the family! 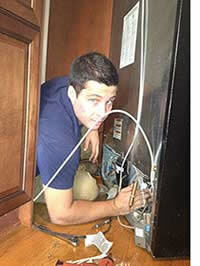 We charge a one time service fee to come to your home and diagnose the problem with your appliance. Our Certified technician will explain the reason for the needed repair, and provide you with written estimate. The estimate will include the service fee. If you choose not to repair, you simply pay the service fee.